A news release from the office of Los Angeles City Councilmember Bill Rosendahl said this afternoon that Beyond Baroque has been saved. According to the release, members of the City Council unanimously approved Rosendahl's motion today to direct city officials to renew and extend Beyond Baroque's "low-cost lease" for 24 years. LOS ANGELES - Beyond Baroque, the nationally acclaimed poetry and literary arts center, will keep its home in the former Venice City Hall, thanks to the actions of Councilmember Bill Rosendahl. The City Council today unanimously approved a Rosendahl motion directing city agencies to renew and extend a low-cost lease, allowing Beyond Baroque to keep its headquarters at 681 Venice Blvd. through 2032. "Beyond Baroque is one of the last bastions of the spoken word in Los Angeles," Rosendahl said. "It is appropriate that it maintain its home and its special relationship with the community of Venice, so long a haven for poets, artists and writers." The council action came after weeks of intense concern by many in the literary arts community worried that Beyond Baroque might lose its headquarters and be forced to close or move from Venice, which it has called home since 1968. City agencies had sought a new policy that would have prohibited low-cost leases with struggling arts organizations. Rosendahl intervened, effectively saving Beyond Baroque from possible extinction. "We are extremely grateful to Councilman Rosendahl for his support and for his leadership," said Fred Dewey, director of Beyond Baroque. "Beyond Baroque is part of Venice, and Venice is part of Beyond Baroque. I am delighted we will be able to stay there, and I am extremely grateful for the City's continued support for the literary arts and for our public mission." 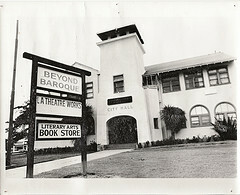 Beyond Baroque has been at its current location since 1979. Its most recent lease, approved in 1997, was set to expire February 29. Rosendahl's motion directs the Department of General Services to renew and extend the existing lease for 25 years, at the current rate of $1 per year. The paperwork should be completed within 30 days. Beyond Baroque is a non-profit poetry and literary arts center with a national reputation for attracting, showcasing and advocating for poets and writers. It has played a significant role in helping Los Angeles become an international arts capital, and has helped to make Venice and Los Angeles a cultural destination. Beyond Baroque offers free workshops and low-cost readings and performances, maintains archives of Los Angeles literature, publishes and sells magazines and books, advocates for Los Angeles writers and artists, and showcases public art projects. The organization serves more than 300 writers and 10,000 residents per year. In exchange for its renewed lease, Beyond Baroque will continue to provide those services, and pay any costs needed to maintain, upgrade and landscape the facility. The building served as Venice's City Hall before the community joined the City of Los Angeles in 1925. *See also: Los Angeles Times story, 03/01/2008.